Due to popular demand and the fact that we love trying weird foods and candies, The A.V. Club will now regularly feature "Taste Tests." Feel free to suggest disgusting and/or delicious new edibles for future installments. The Sonic Drive-In chain is hardly the first restaurant in America to give fried macaroni and cheese a try–scattered bars, diners and even a few sit-down restaurants have featured breaded and deep-fried pasta balls before–but Sonic's version removes any "comfort food" justification for the treat and instead gives it a carny spin, making its "Mac 'N' Cheese Bites" as cheap, greasy and dangerous to your health as a 40-year-old Tilt-A-Whirl. Taste: In consistency and appearance, the exterior of the MNCBs could pass for a Chicken McNugget, all crispy and soft. 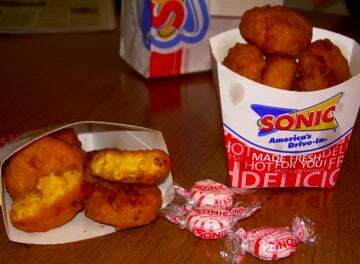 And while everything that Sonic deep-fries comes up tasting sweet instead of savory–from the onion rings to the seasonally available jalapeno sticks–the combination of the creamy, Kraft Cheese-y interior and the sugary batter of the MNCBs is, at first bite, ridiculously satisfying. That is, until the experience gets corrupted by the macaroni, which interjects itself between the molten middle and the crusty coating with its own crude, inappropriately squiggly texture. The next bite goes the same way, with high hopes and an initial rush falling away as the diner realizes that he's attempting to consume a mouthful of chalky macaroni, in a car that smells increasingly like a dairy fart. Office reactions: "This will save a lot of lives, because you know hard it is to eat a bowl of mac 'n' cheese and drive?" "This is exactly what you'd expect: total truth in advertising." "Sticky and kind of weird." "This is like white trash sushi." "You know how when you reheat mac 'n' cheese and it's really disgusting but you eat it anyway? This is like that, but deep-fried." "I bet with the right combination of beer and weed these would be pretty good." Where to get it: The good news is that if you live near a Sonic, you can snack on these bad boys whenever you like, since Sonic serves its full menu all day and all night. The bad news is that if you live near a Sonic, you probably reside in some hick shithole.